The design team from LAN Associates joined with students and staff of Leonia High School, as well as elected officials to celebrate the grand opening of the new Culinary Arts Lab. The state-of-the art facility will further expand the district’s culinary arts program and enhance student’s education through learning by doing. The Culinary Arts Lab is equipped with restaurant-grade, stainless-steel appliances and counters, three compartment sinks, and large ranges with salamanders. 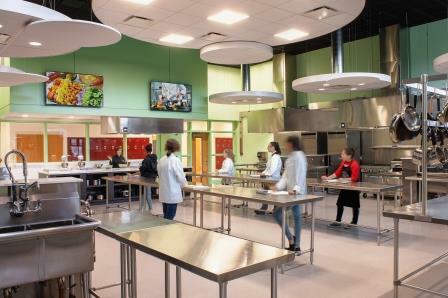 The lab is designed with six individual learning kitchens, as well as a large instructional station with demonstration TV’s throughout the Lab. As part of the ribbon cutting event, a demonstration by local Chef Tomer Zilka of Patisserie Florentine featured first official use of the space, whipping up bananas foster for the guests. Advanced culinary students assisted in serving desserts and leading building tours of the new space. Famous alumni Chef Deuki Hong, a Leonia Culinary Academy graduate, is one attribute to the success of the culinary program at Leonia High School. Based out of San Francisco, he has remained a tremendous supporter to the development of the culinary program at Leonia High School, where his culinary roots began. He is a Zagat 30 Under 30 winner, co-author of Koreatown, and graduate of Culinary Institute of America. Hong gives back to the academy each year, sponsoring culinary students with materials and equipment to ignite and further advance their culinary careers. Staff and students are eager to host its annual Cupcake Wars Fundraiser and is already planning to utilize the culinary program as a resource to the community and local organizations. Culinary students also participate in the Annual Senior Citizens Dinner, where they prepare gourmet meals for local senior citizens, a tradition for more than twenty years in Leonia. Aside from the culinary lab, the project also expanded the school cafeteria, created additional classrooms, and provided various interior upgrades. Photos of the event and new culinary lab are attached.